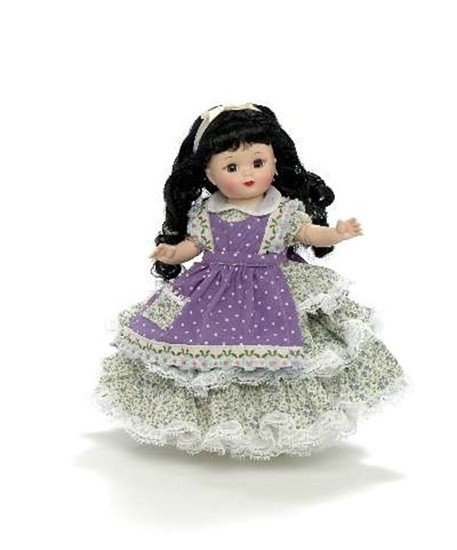 This is an 8-inch fully articulated Maggie doll from the Little Women Collection. We are pleased to share "Bridesmaid Beth" an 8-inch fully articulated Maggie from the Little Women Collection from Madame Alexander. She has blue eyes and curly black hair that is pulled back on the sides and features bangs. She is dressed in a Victorian style dress and pinafore. The dress is made from a small floral print in shades of teal and light green with short puffed sleeves, a white organdy Peter Pan collar, white pearl buttons down the front and a full skirt comprised of three tiers of lace-trimmed ruffles. The pinafore of a woven, lavender polka dot has a floral print pocket trimmed with white picot and filled with bright pink flowers. Blue floral trim at the hem and along the sides of the big completes the apron and the overall look of the gown. A white organdy and tulle petticoat, white cotton pantaloons, white stockings, white vinyl high button boots and an ivory satin headband complete this ensemble. A small grey plush cat is carried in her arms.